As you get older, you may experience physical changes that impact flexibility, agility, strength and endurance such that falls become a significant risk to your independence. 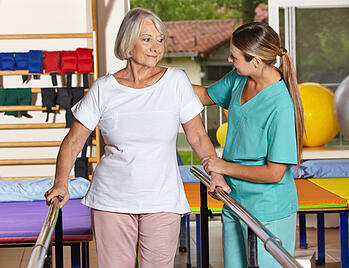 Of course, preventing falls altogether is the ultimate goal. However, if you've already experienced a fall, the goal then is to attend a rehabilitation program so that you can return to normal function and prevent further falls from happening. Once you arrive at the rehabilitation facility, licensed physical and occupational therapists will work with you to review your past medical history, physical impairments, and history of falls, if applicable. You will also be evaluated for problems with walking, weakness in your lower body, joint limitations, the strength of your standing balance, and whether or not you must use adaptive equipment such as a walker, cane or wheelchair to be mobile. Therapists will construct an exercise program for you that will decrease your risk of falling by improving your flexibility, strength, balance, mobility, posture and stability. Although you must attend rehabilitation so that you can recover from injuries already suffered in a fall, it's equally important to prevent future falls. If you can prevent falls from happening, your functional mobility will likely improve greatly. Moderate exercise is an important component in a fall prevention and rehabilitation program. Your occupational and physical therapists will develop strategies to help you learn how to deal with real world situations that may threaten your stability. Obstacles that can increase the risk of falling already exist in everyday life. You can't always avoid being around them, but you can learn techniques that will help you manage them. For example, your therapist may have you walk through an obstacle course with conditions present that threaten your stability, such as puddles of water that you could slip in. Challenging yourself with these obstacles in a safe and controlled environment lets you learn how to manage them without putting you in actual danger of falling. You may think that your home is the safest place for you, but think again. Although you may have it set up to deal with your needs explicitly, you may have home hazards that you aren't aware of and that will put you at greater risk of falling. A medical alert device may help you by allowing you to call for help if in fact you do slip and fall. What happens after you have completed rehabilitation? Once you've met the goals set forth at the beginning of your program, you'll be given a home exercise program that you can do to continue to improve your stability and your current level of functioning. This will go a long way toward helping you stay on your feet so that you don't fall again. The program you are given will be specifically designed for you based upon your current physical impairments, and your current and desired levels of functional independence. Your therapist may also be able to help you discover exercise possibilities in your community beyond those that exist in outpatient rehabilitation. Falls don't have to be a given as you age. Medical alert devices can help you feel safer by giving you the ability to call for help if you need to. If you've already taken a fall, enrolling in an inpatient rehabilitation program will help you focus on building strengthen, balance, and agility so that once you have recovered, you won't fall again.